"Tropic" and "Tropical" redirect here. For other uses, see Tropic (disambiguation) and Tropical (disambiguation). Areas of the world with tropical climates. The tropics are the region of the Earth surrounding the Equator. They are delimited in latitude by The Tropic of Cancer in the Northern Hemisphere at 23°26′12.4″ (or 23.43678°) N and the Tropic of Capricorn in the Southern Hemisphere at 23°26′12.4″ (or 23.43678°) S; these latitudes correspond to the axial tilt of the Earth. The tropics are also referred to as the tropical zone and the torrid zone (see geographical zone). The tropics include all the areas on the Earth where the Sun contacts a point directly overhead at least once during the solar year (which is a subsolar point) - thus the latitude of the tropics is roughly equal to the angle of the Earth's axial tilt. The tropics are distinguished from the other climatic and biomatic regions of Earth, which are the middle latitudes and the polar regions on either side of the equatorial zone. The tropics comprise 40% of the Earth's surface area and contain 36% of the Earth's landmass. As of 2014[update], the region is home to 40% of the world population, and this figure is projected to reach 50% by the late 2030s. 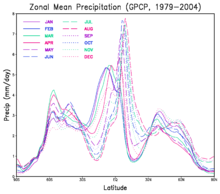 A graph showing the zonally averaged monthly precipitation. The tropics receive more precipitation than higher latitudes. The precipitation maximum, which follows the solar equator through the year, is under the rising branch of the Hadley circulation; the sub-tropical minima are under the descending branch and cause the desert areas. "Tropical" is sometimes used in a general sense for a tropical climate to mean warm to hot and moist year-round, often with the sense of lush vegetation. Many tropical areas have a dry and wet season. The wet season, rainy season or green season is the time of year, ranging from one or more months, when most of the average annual rainfall in a region falls. Areas with wet seasons are disseminated across portions of the tropics and subtropics. 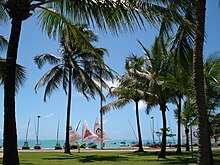 Under the Köppen climate classification, for tropical climates, a wet-season month is defined as a month where average precipitation is 60 millimetres (2.4 in) or more. Tropical rainforests technically do not have dry or wet seasons, since their rainfall is equally distributed through the year. Some areas with pronounced rainy seasons see a break in rainfall during mid-season when the intertropical convergence zone or monsoon trough moves poleward of their location during the middle of the warm season; typical vegetation in these areas ranges from moist seasonal tropical forests to savannahs. When the wet season occurs during the warm season, or summer, precipitation falls mainly during the late afternoon and early evening hours. The wet season is a time when air quality improves, freshwater quality improves and vegetation grows significantly, leading to crop yields late in the season. Floods cause rivers to overflow their banks, and some animals to retreat to higher ground. Soil nutrients diminish and erosion increases. The incidence of malaria increases in areas where the rainy season coincides with high temperatures. Animals have adaptation and survival strategies for the wetter regime. The previous dry season leads to food shortages into the wet season, as the crops have yet to mature. However, regions within the tropics may well not have a tropical climate. Under the Köppen climate classification, much of the area within the geographical tropics is classed not as "tropical" but as "dry" (arid or semi-arid), including the Sahara Desert, the Atacama Desert and Australian Outback. Also, there are alpine tundra and snow-capped peaks, including Mauna Kea, Mount Kilimanjaro, and the Andes as far south as the northernmost parts of Chile and Argentina. Tropical plants and animals are those species native to the tropics. Tropical ecosystems may consist of tropical rainforests, seasonal tropical forests, dry (often deciduous) forests, spiny forests, desert and other habitat types. There are often significant areas of biodiversity, and species endemism present, particularly in rainforests and seasonal forests. Some examples of important biodiversity and high endemism ecosystems are El Yunque National Forest in Puerto Rico, Costa Rican and Nicaraguan rainforests, Amazon Rainforest territories of several South American countries, Madagascar dry deciduous forests, the Waterberg Biosphere of South Africa, and eastern Madagascar rainforests. Often the soils of tropical forests are low in nutrient content, making them quite vulnerable to slash-and-burn deforestation techniques, which are sometimes an element of shifting cultivation agricultural systems. In biogeography, the tropics are divided into Paleotropics (Africa, Asia and Australia) and Neotropics (Caribbean, Central America, and South America). Together, they are sometimes referred to as the Pantropic. The Neotropical region should not be confused with the ecozone of the same name; in the Old World, there is no such ambiguity, as the Paleotropics correspond to the Afrotropical, Indomalayan, and partly the Australasian and Oceanic ecozones. "Tropicality" refers to the geographic imagery that many people outside the tropics have of that region. The idea of tropicality gained renewed interest in modern geographical discourse when French geographer Pierre Gourou published Les Pays Tropicaux (The Tropical World, in English), in the late 1940s. Tropicality encompasses at least two contradictory imageries. One is that the tropics represent a Garden of Eden, a heaven on Earth; the alternative is that the tropics are primitive and essentially lawless. The latter view was often discussed in Western literature—more so than the first. Evidence suggests that over time the more primitive view of the tropics in popular literature has been supplanted by more nuanced interpretations that reflect historical changes in values associated with tropical culture and ecology, although some primitive associations are persistent. Western scholars also theorized about the reasons that tropical areas were deemed "inferior" to regions in the Northern Hemisphere. A popular explanation focused on the differences in climate—tropical regions typically have much warmer weather than northern regions. This theme led some scholars, including Gourou, to argue that warmer climates correlate to primitive indigenous populations lacking control over nature, compared to northern populations having "mastered nature". ^ "How much land is in the tropics?". God Plays Dice. 2007-12-04. Retrieved 2017-06-26. ^ "tropics". National Geographic Encyclopedia. National Geographic Society. Retrieved 2017-06-26. ^ "Expanding tropics will play greater global role, report predicts". Science Magazine. 29 June 2014. ^ Glossary of Meteorology (2009). Rainy season. Archived 2009-02-15 at the Wayback Machine American Meteorological Society. Retrieved on 2008-12-27. ^ Elisabeth M. Benders-Hyde (2003). World Climates. Blue Planet Biomes. Retrieved on 2008-12-27. ^ Menadue, Christopher B. (2017-05-30). "Trysts Tropiques: The Torrid Jungles of Science Fiction". eTropic: electronic journal of studies in the tropics. 16 (1). doi:10.25120/etropic.16.1.2017.3570. ISSN 1448-2940. Wikimedia Commons has media related to Tropics.